Several years ago we visited Arlington Cemetery. It was a sobering experience. Rows and rows and rows of headstones of men and women who gave their lives for the cause of their country. 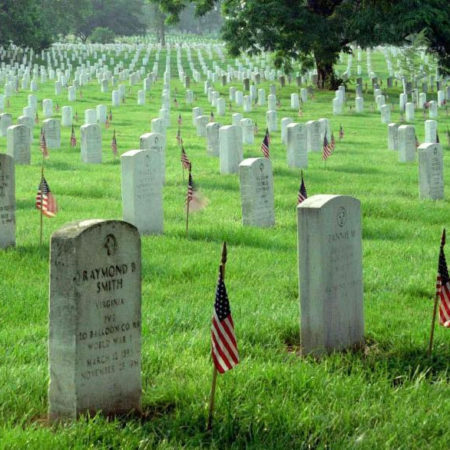 Right or wrong, agree or disagree with the reasons for war, these people sacrificed their lives. I truly felt like I was standing on holy ground. Later on in that visit we went to the World War II Memorial as well as the Vietnam Memorial. I touched that wall with the 57,939 names and I welled up with tears. I didn’t know anyone who died in that war but I was overcome with emotion. Perhaps it was the senselessness of it all or maybe my heart just ached for all those mothers and fathers and family members and friends who lost somebody they loved at such a young age. When I was a child I liked to play war. I liked to pretend to kill the Germans and Viet Cong as I played with my brothers and my friends. We called each other “Doc” and “Sarge” like they did in the T.V. show “Combat” and my parents bought us toy guns and hand grenades so we could have a good time killing each other. As I got older I was intrigued with the nuclear arms race and supported America’s rise as the top military in the world. I voted for candidates who promised to pour millions into the defense budget and I talked bravely of the United States being a world power. I admire and honor all those who have given their lives for my freedom. They are much braver than I could ever pretend to be. But honestly, I have come to the point in my life that I hate war. I am not a pacifist necessarily but the older I get the more I hate the idea of killing people in the theater we call war. I think wars can be averted. I think at the root of all wars is an insatiable greed and overwhelming fear that makes enemies of fellow human beings. I don’t know if it is ever necessary. Maybe it is. I just wish it wasn’t. I can say this pretty confidently…It is not the way of Jesus. If we all followed His teachings and lived by His way of love there would be no need for war. I can also say fairly confidently, this will never be the case until He returns. But when He does return there will be no more war. War will cease and peace will reign. Read the book of Revelation if you don’t believe me. Bob Dylan turned 77 this week; 56 years ago he wrote a simple folk song that still expresses an inner craving of the soul. Will it ever stop? How many more deaths until we can say that too many people have died? The answer, unfortunately, is still blowing in the wind.